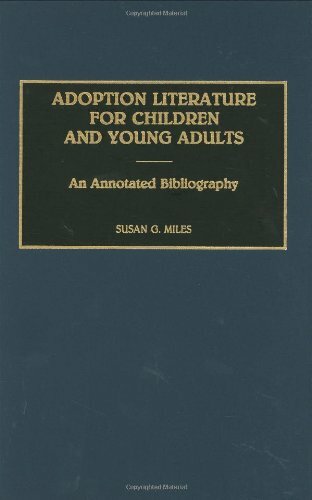 This extensive annotated bibliography covers the literature published since 1900 suitable for children and young adults dealing in some fashion with adoption. The 503 titles annotated in this volume are divided into fiction and nonfiction by reading level. A comprehensive subject, as well as title and author index, assures access to the books cited within the bibliography. Although most of the books included feature adoption as a main theme, others use adoption as a secondary theme, while others have characters who just happen to be adopted. The lengthy annotations will allow the readers an opportunity to evaluate each title's usefulness. The bibliography encompasses such topics as the age of arrival, sibling adoption, single-parent adoption, foster parent adoption, step-parent and relative adoption, transracial and intercountry adoption, Amerasian children, racial identity, minority families, special needs, large families, birthparents, search and reunion, surrogacy and open adoption, and some of the less pleasant aspects of adoption. This book, compiled by a reference librarian who is also an adoptive parent, brings a wealth of information to adoptees, adoptive parents and support groups, adoption agencies and their personnel, librarians, educators and family therapists. The experiences and emotions described in the hundreds of compiled titles duplicate and validate those of every adoptive family. Each title includes complete bibliographic information, pagination, and OCLC number (when available). Also featured is a selective resource list and a directory of adoption-related organizations.